Enjoy an amazing last minute break with these seven stunning escapes in the UK. 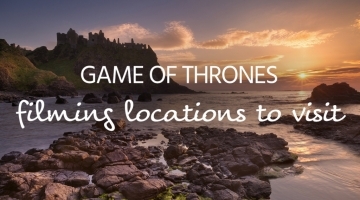 Stay in amazing ancient castles, stunning Highland lodges, gorgeous romantic retreats and more! Perfect as a couple’s retreat, or to be booked with Mid Balchandy Cottage to provide accommodation for 6 guests, this beautiful property offers equally amazing views. Enjoy panoramic vistas up the glen towards Strathtummel with the River Tummel below. There’s no better holiday inspiration! Needless to say, the location of this property is stunning, but it’s no slouch in the comfort stakes either. There’s a wood burner set in a Caithness slate hearth, perfect on a winter’s evening! Enjoy underfloor heating in the shower room plus towels, bathrobes, slippers and toiletries provided. Northumberland offers an amazingly scenic escape with stunning views as far as the eye can see, fantastic eateries and amazing activities. Visit The Oldgate and you have a wonderful base to explore it from too. A stunning studio apartment close to Alnwick Castle and the National Park, you will find amazing accommodation awaits. Enjoy original features and complete contemporary comfort; it’s the perfect escape for 2! Live out your holiday fairy tale at this unique and beautiful cottage. Surrounded by a 400 acre estate and grounds this amazing holiday home offers a turret and cosy open fires in the living room and bedroom. You can walk and go horse riding on the estate or wander amongst wildlife (herds of roaming deer, buzzards and more) – it offers the ultimate in luxurious relaxation. Go the extra mile and you can enjoy catering and housekeeping by arrangement. With so much comfort and warmth, you will find it to be far more Sleeping Beauty than Frozen. The perfect place to get away from it all with a large group of friends and family, this Highland lodge offers an unforgettable experience. Sitting on the edge of an ancient Caledonia forest, the great outdoors has never looked greater. Explore moorland and mountains with red squirrels, mountain hares, red and roe deer as your neighbours. Aviemore is just 12 miles away and offers superb shops, restaurants and bars. Active adventurers can enjoy skiing and snowboarding, mountain and quad biking, climbing and hill walking plus a variety of water sports. Return to your accommodation to enjoy a private hot tub, wood burning stove and sauna. Gorgeous and stylish accommodation awaits at this getaway in Suffolk. Made with luxury in mind, you will find an elegant interior with wonderful accoutrements like a four poster bed. The well-equipped kitchen is the perfect place to cook up a storm, and guests have access to some amazing ingredients too. Enjoy full access to the organic orchard and vegetable garden. You can also enjoy fresh honey and freshly laid eggs! Unwind in style at the on-site hot tub, sauna, gym and steam room, then relax in complete comfort at your accommodation afterwards. G&Ts on the terrace in summer, hot chocolate by the fire in winter – what could be better? 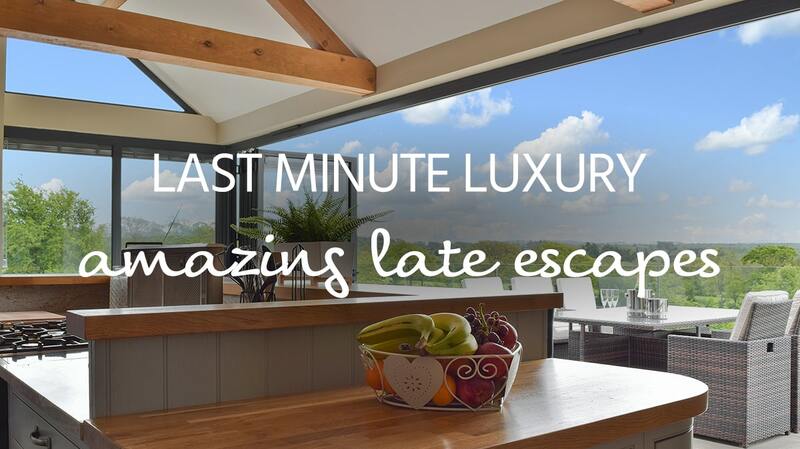 Last minute luxury needn’t be an intimate affair! Bring 21 friends and up to 4 pets to this simply stunning moated castle and you can live like kings and queens for a week or weekend. 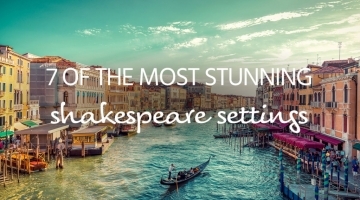 There are tapestries, suits of armour, carvings, four poster beds, chandeliers and more. Enjoy modern comforts like a full sized billiard table, gym equipment and a large commercial style kitchen. A lovely village location and setting in the heart of Staffordshire moorlands makes exploring your surroundings a joy. You’ve never had a holiday like this! Once this traditional farm-house was completely derelict. Fast forward five years and it is now one of the finest luxury properties in our collection, working perfectly to showcase its own beauty and those of the stunning surrounds. 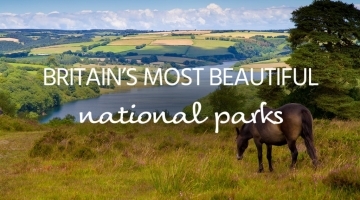 Enjoy amazing views over the Tivy Valley Nature Reserve with a backdrop of the Preseli Mountains. Take a dip in the hot tub and you can complement the views with some seriously enjoyable relaxation. It’s one of the best ways to welcome the winter.